Almost 99 million adults in the United States have what is considered borderline or high cholesterol. And just in time for Thanksgiving, CBS News Medical Correspondent Dr. Jennifer Ashton sat down with Early Show co-anchor Harry Smith to test his knowledge about which foods can lower or raise it. True or false: Avocados can lower your bad cholesterol and raise your good cholesterol? "I'm hoping it's not a trick question. I'm going to say it's true. Because I know it can help your good cholesterol," Smith said. "That is correct, Harry. You're one for one. So avocados are a good source of fat/cholesterol. They have the unsaturated fats, which are good for us. So therefore they can raise the HDL, the Harry or healthy cholesterol and lowerer the LDL - the lousy cholesterol," Ashton said. 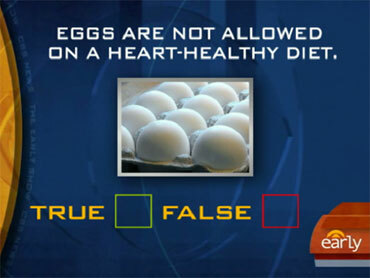 True or false: Eggs are not allowed on a heart healthy diet? "It seems like a trick question because you think about the eggs, you think about them being a cholesterol spiker, but that's probably not true. So it's false," Smith said. "You're right, you're two for two. This is a big myth. Because people think of they eggs and they think of the omelet with bacon and cheese. Actually, eggs, while high in cholesterol, have about 215 milligrams, well below the 300 milligram limit per day. If you have normal cholesterol, you can go ahead and have one egg a day," Ashton explained. True or false: Cholesterol-free food can still raise cholesterol? "I'm going to say true," Smith said. "You're three for three, that's correct. You can't confuse what's on the label in terms of cholesterol and fat. And remember that transfats, which can be hidden in a lot of packaged foods, can increase your cholesterol," she said. True or false: Eating a high-carb diet can raise cholesterol? "You're a genius, Harry! That is true," Ashton said. "And again, they've actually done studies looking at the Atkins type diet and found if people restrict their carbohydrates, it can increase their HDL or good cholesterol. True or false: Drinking alcohol lowers cholesterol? "I say false," Smith said. "In moderation, you're correct, it's false. In moderation, it can raise your HDL," Ashton said. "I say worry about the other 364 days a year, not so much tomorrow!"